The High Court is to decide whether to continue treating a seriously-ill nine-month-old baby. Alder Hey Children's Hospital in Liverpool has secured a court hearing to rule on the fate of Luke Winston-Jones, from Holyhead, Anglesey. Doctors are concerned about the effects of further treatment on Luke, who has a rare genetic disorder. His mother Ruth wants treatment to continue and has asked the people of Wales to support her fight. The Royal Liverpool Children's NHS Trust and the North West Wales NHS Trust made an application in London on Wednesday to be granted a hearing at the High Court. It will now take place at the Family Division of the High Court before Dame Elizabeth Butler-Sloss on Thursday 21 and Friday 22 October. Luke was treated at Ysbyty Gwynedd in Bangor for most of his life before being transferred to Alder Hey hospital last week for tests. The hospital wants to be able to let Luke die should his condition worsen as they say treatment for him may become increasingly aggressive. But his mother Ruth wants them to carry on treating him. "Luke is a beautiful little boy who has grown against all the odds," Mrs Winston-Jones said. "Please help me keep my little boy alive - he is doing it on his own." Rebecca Burke, executive director of the Royal Liverpool Children's NHS Trust, said: "This has been a difficult and rare course of action to take but both trusts believe that it is in Luke's best interest to seek the court's direction on this important and complicated matter. "We acknowledge how strongly Luke's family feels and that this is a most painful time for them." Luke's family's solicitor Tim Annett said on Wednesday morning: "Understandably, [Mrs Winston-Jones] wants to make the most of the time she has with him. "She doesn't feel that it is Luke's time and he therefore deserves every chance at life." "Cases such as this raise many difficult questions for doctors and parents, and where there is a disagreement the court has to decide what the child's best interests are. "The starting point is a very strong presumption in favour of a course of action, which will prolong life, but in rare cases the court will authorise doctors to withdraw or withhold life-saving treatment against the parents' wishes." 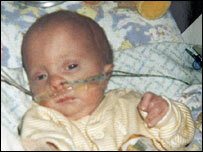 Luke has Edwards Syndrome, also known as Trisomy 18. 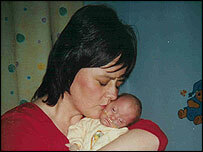 Last week, a judge ruled doctors should not resuscitate a baby who was born very prematurely if she stopped breathing. Charlotte Wyatt was born weighing just one pound with serious heart and lung problems, and her parents had argued doctors should revive her if necessary.